David, nerdy high school student, flees reality by watching Pleasantville - a 1950's b&w sit-com, where everything is just that... pleasant. His sister Jennifer, sexually far more active than her brother, gets in a fight with him about a very strange remote control. The remote was given to them just seconds after the TV broke, by an equally strange repair man. 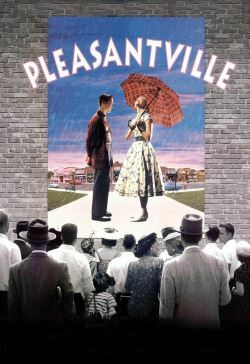 They suddenly find themselves in Pleasantville, as Bud and Mary-Sue Parker, completely assimilated and therefore black and white, in clothes a little different and with new parents... pleasant ones. David wants to get out of the situation as well as his sister, but whereas he tries to blend in (effortlessly, with his knowledge), she does whatever she wants to do. One event leads to the other, and suddenly there is a red rose growing in Pleasantville. The more rules are broken, the more colorful life gets in Pleasantville, USA.